seaatlastHave you caught one of our afternoon shows at @madewestbeer yet? First Annual Gypsy Wedding Festival! It's a music and cultural arts event-festival-wedding, based on bringing Gypsy Romani cultures together! It's organized by Musical Connections nonprofit based out of Austin Texas, enthusiasts of Gypsy music along with musicians that are from Gypsy ethnicity, along with dance performers from all over the world and local artists that keeping the live music alive. Festival visitors will witness unique Gypsy - Romani traditional wedding ceremonies and learn about traditional gypsy music, and dance. Musicians! Play gypsy music on the small stage there will be challenge contest sign up- how much "gypsy" can you play! Workshop on how to gypsy dance, steps in the gypsy dance, learn about traditional gypsy wear. Experience the taste of authentic and local foods check out art vendors! We invite you to be a part of our celebration and witness firsthand the joy and cultural unity behind our First Annual Gypsy Wedding Festival, the event that we believe is unique to Austin area and to a state of Texas. Sea At Last in concert - Print Exchange with Santa Barbara / Ventura artists as well! Sea At Last coming out on Vinyl! Come to the next two shows to get the details of where you can get a copy! 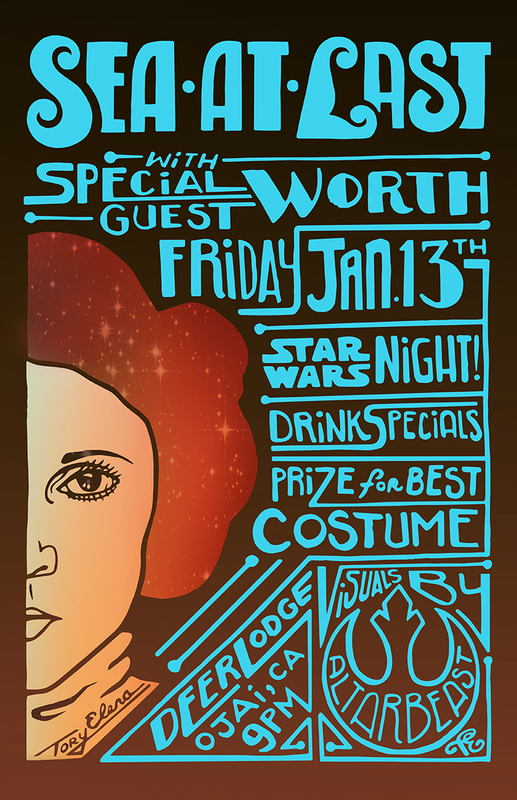 Tour Poster by Tory Elena says it all: STAR WARS PARTY!!! Sea At Last - playing first show back from UK - get there early for a surprise!